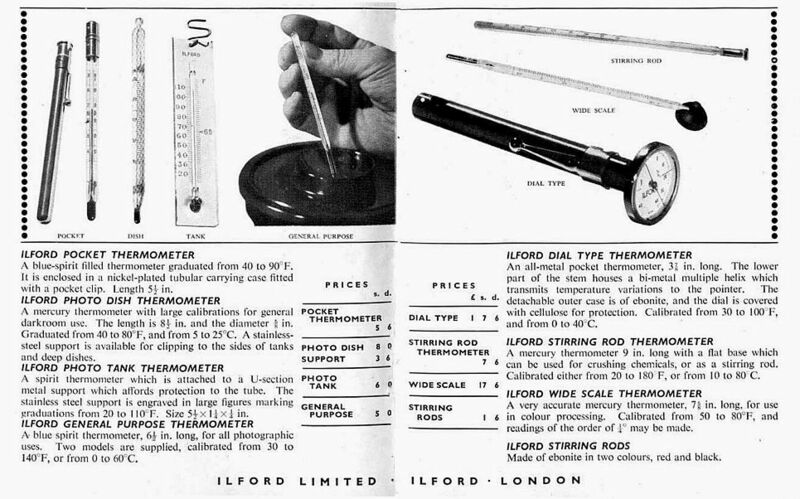 As would be expected, Ilford provided a range of different types of thermometers for use in the developing and printing of films and prints. The image below is taken from a 1953 catalogue of ILFORD Photographic Materials and Accessories and shows seven different types. Simon Gowen has sent me pictures of an Ilford General Purpose Thermometer (price 5s in the above catalogue = 25p; made in England). He says it belonged to his late uncle, an ex-WW2 pilot who passed away recently (2014). He says "My uncle was a pilot in the 1940's so this (thermometer) stems from his days in the RAF. I also have a receipt relating to photographic paper, purchased from Ilfords of London, before the London bombings (the Blitz). Ilfords would ship out photographic paper to him, possibly when he was based in either Arizona or India". 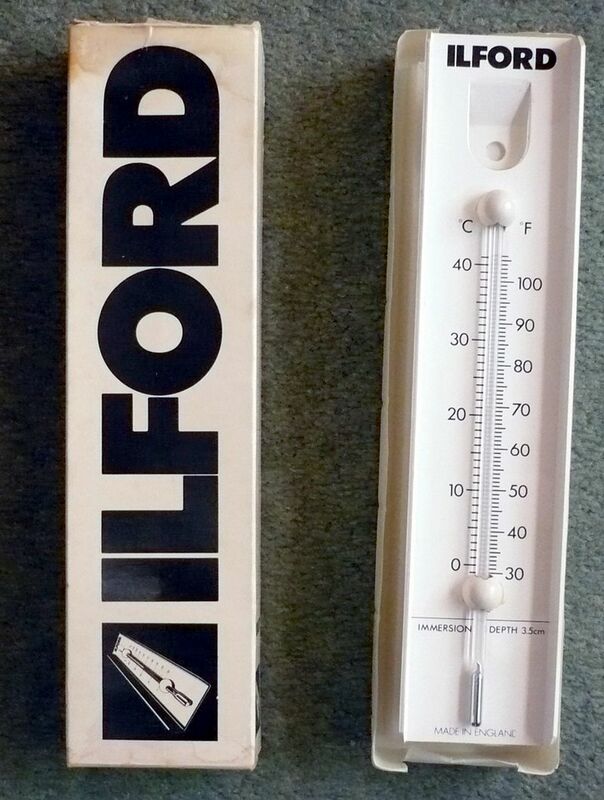 Below is a much more recently manufactured Ilford 'mercury in glass' thermometer; picture supplied by David Muggleton. Although marked with an immersion depth (35mm) for measuring solution temperatures, the rectangular design isn't the normal one used for a darkroom thermometer. It can't, for example, be inserted down the small diameter hole in the centre of a developing tank to measure developer temperature during film development. The design looks more suited for wall hanging, to monitor the overall air temperature of the darkroom. David tells me he has no knowledge of its intended use, but that the box is marked with the usual Ilford dating system, this time G.81, meaning it was made around July 1981.